Apologies for not getting back to WMCIR participants this week. As you can see, I’ve been pretty quiet on my blog this week. I’ve been traveling and came back very sick with a nasty cold. But reading was still happening in the house while I was gone. Smarty’s kindergarten assignment was The Grouchy Ladybug by Eric Carle, and I supported the theme by bringing home more Eric Carle books. We also own quite a bit of our favorites from toddler times, but I chose to review here longer books more suitable for 4+ crowd. To be honest, The Grouchy Ladybug is not one of our favorites. Smarty gave it “no good” rating in her book journal. On the redeeming side, the book teaches time and it also shows relative size of the grouchy ladybug to the progressively bigger animals that he wants to fight. Smarty found that part amusing and even acted out the story for me to cheer me up as I lay sick in bed. I thought that we read all Eric Carle books by now, but I was wrong. Pancakes, Pancakes! was new to us. The story is somewhat similar to How to Bake An Apple Pie, except the main character doesn’t travel so far to get all the ingredients for pancakes. The book also takes the reader through an actual process of cooking pancakes including the recipe, but I have a hunch that this is the recipe for crepes (which we like), not for fluffy American pancakes that most people here prefer. Smarty was excited to see A House for Hermit Crab. She said that this book and Mr Seahorse are her favorite books by Eric Carle, because Mr Seahorse and Hermit Crab are “nice”. I think this book could be used to study adjectives – the language is very descriptive, and Hermit Crab gives great compliments as he collects friends to help him make his house nicer. Smarty especially liked the ending of the book, but I won’t reveal it here. Walter the Baker is another unexpected find of this week. Have you ever wondered who invented a pretzel? Well, Eric Carle offers his version of events. Smarty didn’t like the book as much as Pancakes, because it involved conflict. In fact, the rulers of the Duchy were downright mean and unfair to their baker in the middle of the story. I keep thinking how nice it would be to follow up the story with actual homemade pretzels – perhaps I will gather my energies for this tomorrow. I hope you're feeling better! 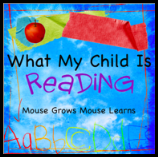 We love Eric Carle books too. I've never heard of Pancakes, Pancakes, but I want to find it now. We read The grouchy Ladybug this week too. Alexis likes the illustrations in the Eric Carle books. JDaniel doesn't like books with conflict either. I wonder if it's a recipe for British pancakes, which are very similar to crepes? My brother makes fantastic crepes, I need him to teach me sometime. And that book is new to us, too, we'll have to look for it! We read Eric Carle books last week, and that was the first time we read the hermit crab one. I haven't read the others on your list. I have a nasty cold too so I haven't done nearly as much blogging as I had planned this week either. I hope you feel better soon! We own all but the last book - haven't read that one! We are big fans of Carle's work. We like Eric Carle books. You have a few here we have not read. I guess you know I will have to look for them. I love Eric Carle books. So sorry you got a cold. Hope you feel better soon. I haven't been feeling well off and on this week, so we didn't get a lot done either. Grouchy Ladybug seems like a good fit with being miserable with a cold. I forget have you read "Slowly, slowly said the Sloth"? I think it's marvelous for its vocabulary. It's one of his newer books, and less popular in general, but I love the sloth's vocabulary. Oh, and I'm with you on not liking Grouchy Ladybug very much, I think partially because the boys went through a phase where they wanted it read 10 times in a day, and I wasn't all that thrilled with it in the first place. I've read Pancakes, Pancakes but not Walter the Baker. I'll have to find that one... yum, pretzels!